A wine cooler is a specialist fridge that helps create the perfect conditions for storing wine. Keep your wine collection at the recommended serving temperature ready to drink. Create the ideal environment for red or white wine with easy to use electronic controls. Most wines should be stored at between 11-14˚c. Wine coolers offer a temperature range of around 5-20˚c. Although it’s built for wine, your wine cooler can be used for storing beer and other drinks. Many people choose a wine cooler because they look great and keep your wine in optimum conditions. 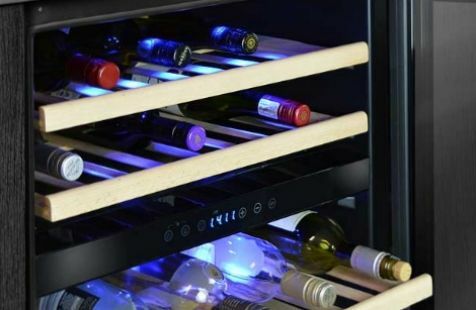 Add the benefits of convenience and easy access and a wine fridge is a must for any connoisseur. A freestanding wine cooler adds a stylish touch to your home. Plug in and cool your wine wherever you choose. An over-temperature alarm will prevent any drastic changes to the storage temperatures. Display your wine collection on wooden slide out shelves. Pick your perfect wine cooler from 3 available sizes.